Australia’s Celine Dion fans will soon have their appetites well and truly whetted with not one, but two new titles set for release late next month. Firstly there’s the ‘Taking Chances World Tour’ live CD and DVD (above). 18 tracks make up the DVD, while 19 will be featured on the CD (both have different tracklistings). The DVD includes ‘The Prayer’, ‘Taking Chances’, ‘River Deep, Mountain High’ and ‘My Heart Will Go On’, along with two medleys, while the CD includes ‘The Power Of Love’, ‘Because You Loved Me’ and ‘All By Myself’. Full tracklisting is in the comments section on the post. Also out late next month is the fly on the wall documentary about the making of the Taking Chances tour. 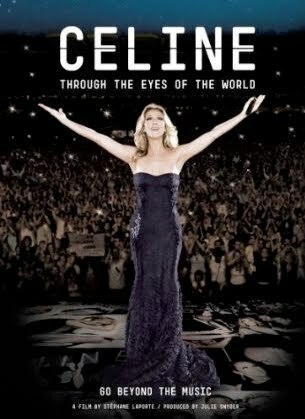 ‘Through The Eyes Of The World’ follows the songstress through five continents, 25 countries and an incredible 93 cities, exposing a side of Celine not often seen by the public. The DVD release also features an extra hour of footage not seen during it’s limited cinematic release. Both are out locally on April 30.
btw Hits Medley includes It’s All Coming Back To Me Now, Because You Loved Me and To Love You More.